Earlier today, an unmanned Russian Progress MS-04 cargo spacecraft broke up in the atmosphere and crashed over Siberia while making its way to the International Space Station. According to Russia’s space agency Roscosmos, the cargo ship was lost at an altitude of 120 miles (190 km) over an unpopulated mountainous region in the Siberian republic of Tuva. It says most of the fragments burnt up upon re-entry, and there are no reports of injuries. Early indications are that the three-stage kerosene-fueled Soyuz rocket, which blasted off from the Baikonur cosmodrome in Kazakhstan, experienced a catastrophic problem during the final stage of its ascent. Above: Video of the launch, which ends about 40 seconds before the failure. The unoccupied ship was filled with nearly 5,400 pounds of fuel, food, and equipment destined for the ISS, which is currently home to three astronauts, Peggy Whitson, Thomas Pesquet, and Oleg Novitsky. NASA says the ISS is currently well stocked, and is not concerned for the crew. Roscosmos sends three or four cargo missions each year to re-supply the space station (another launch is scheduled for February 2, 2017). Roscosmos said the loss of the spacecraft will not impact the normal functioning of the ISS, or the crew’s routine operations. Russian controllers on Earth were alerted to a problem when the time telemetry transmission ceased at the 6:23 mark of the mission. “Routine control systems failed to register the spacecraft in the designated orbit,” noted Roscosmos in a statement. An explosion has not been ruled out as a possible cause for the failure. A state commission is currently looking into the situation. 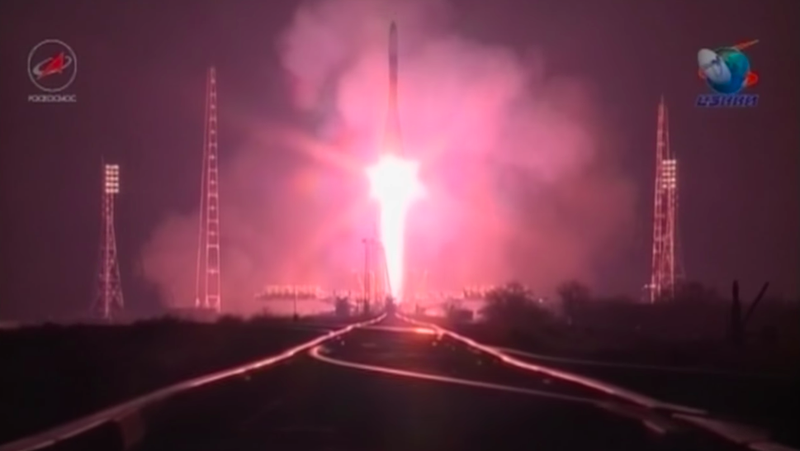 This is now the second failed launch of a Progress cargo ship in less than two years. In April 2015, a similar incident occurred, with Russia attributing the failure to a fault with the Soyuz rocket. A hold was placed on space travel for nearly three months, forcing a group of ISS astronauts to prolong their stay in space by an entire month—a factoid the current crew might find a tad concerning.